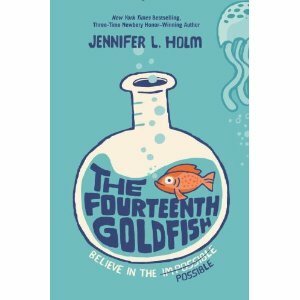 The Fourteenth Goldfish is another accessible, engaging work from Jennifer L. Holm. Ellie is 11 years old. Her mother is a drama teacher in a high school and her father is an actor. Although divorced, both parents are involved and present in Ellie’s life. Her mother’s boyfriend, Ben, is a welcome addition as far as Ellie is concerned because he treats her mother well and doesn’t try to be her dad. These relationships, in themselves, are a refreshing read as they model kindness, compassion and family in the best light. When we first meet Ellie she is with a babysitter since her mother is unusually late getting home. When she finally does arrive she is accompanied by a 13-year-old boy. The boy is her grandfather (mother’s father), Dr. Melvin Sagarsky. Dr. Sagarsky has discovered a compound made from a rare species of jellyfish which has enabled him to reverse the process of aging. Unfortunately, now that he has discovered it and regressed to 13 years of age he can no longer get into his laboratory–which is where the compound remains. As he tries to figure a way to recover his valuable discovery, Melvin lives with Ellie and her mother–and attends middle school with Ellie. What makes The Fourteenth Goldfish special is that, in addition to the contrast of generations and physical attributes which provide countless comedic opportunities, Ellie makes the pivotal discovery that science and art must combine to create the endless possibilities in our existence. Her parents see the joy and value of the arts whereas her grandfather sees only the opposite. Ellie is the one who truly sees the wonder that results from their interweaving. The Fourteenth Goldfish is an excellent independent or read-aloud choice at home or in the classroom. It provides pure enjoyment as well as the opportunity to springboard discussion about the contributions of science AND art to our civilization and culture in both personal and global experience. AND it’s funny! My 4th Graders are loving it!